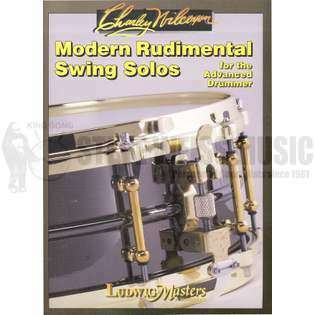 Charley Wilcoxon's Modern Rudimental Swing Solos for the Advanced Drummer is a collection of challenging rudimental snare drum solos for the advanced drummer, originally printed in 1941. 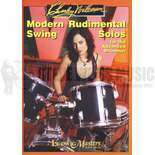 Each solo is based on certain rudiments or combinations, as well as the use of swing rhythms popular among many of today's drummers. Love this book , I had this in the 70' when I took lessons. I bought this as a spare :) every drummer should have this one ! They shipped it out fast , the price was very fair , and great packing . Thanks :) I would buy again from them ! Great book. I've had copy of the book for years that needed to be replaced. I hate practicing rudiments, but the solos in this book are extremely challenging, fun to learn and offer a musical and jazz oriented approach to the rudiments. Included in the front is a list of the rudiments and exercises. As a jazz drummer, I find it more relevant to my playing than sitting in front of a click doing double strokes. Interesting book to study. The studies are short, and all are based on rudiments. As a student of Charley Willcoxon many years ago, I can attest to his excellence as a teacher. When I first went to him, he refused to teach me unless I started from the beginning basically "checking" the strokes on the page, especially the accented beat of a flam. That accent, as in left/RIGHT, that is the right stick, could not be allowed to rebound higher than 1/2 inch or so.......Whenever Buddy Rich or Joe Morello would come into town ( Cleveland), they would visit him and take a lesson. He was very much into "form." A great man. best, Angelo Mauceri. My core teacher was Robert Pangborn of the Cleveland Orchestra.